Weekday breakfast are usually simple -- eggs in one form or another, toast, coffee and juice or fruit. 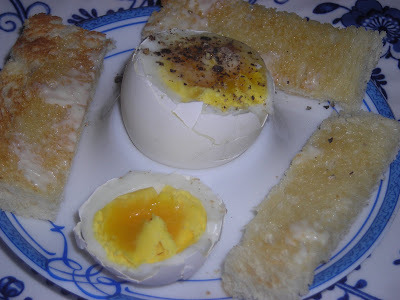 I love the simplicity of a boiled egg especially when served with toast soldiers to dip into. We have egg cups -- the ones that are big at one end to eat the egg from and smaller at the other to hold the egg when you bring it to table. But this weekend I found some more -- French ones in blue and white. 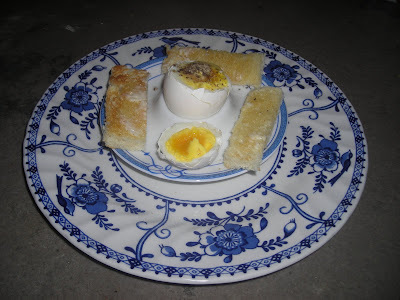 I only got two for soft boiled eggs are served to us -- not company and I need no more than two. The dishes reminded me of the ones in Europe and so even though they were bought here many years from our last trip -- they are still memories of that trip. They look good with the blue and white English breakfast plates. I find that unlike other colors all blues seem to go together. We always eat breakfast in our room with three walls of glass which we've named the "Breakfast Room" -- Linderhof's kitchen is so small that there was no room for a casual table and our addition takes care of that need. 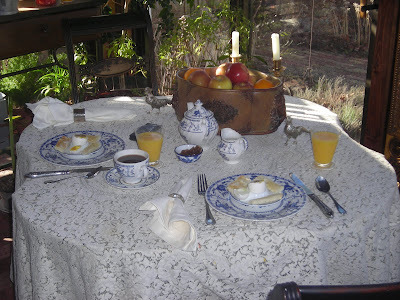 It's a great place to start the day -- with coffee and then breakfast while watching the birds in the garden. 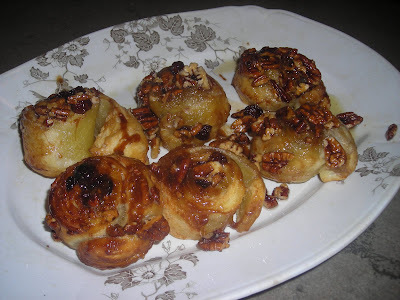 I love homemade baked baked goods and am especially fond of sticky buns. Even more so than just cinnamon rolls. The sticky syrup on top and the pecans . . . heaven! But I like easy as well especially for breakfast. These sticky buns certainly fit the bill -- the hardest part of the recipe is remembering to thaw the puff pastry. Since there were only four of us, I only made half the recipe and they were gone in a thrice -- I think we COULD have eaten twelve of them. They certainly are addictive. If you want to impress your family or your coworkers, these certainly would. And if you want easy in the morning, these can be assembled the night before, covered and refrigerated. Then for breakfast, all you need to do is pop them in the oven. 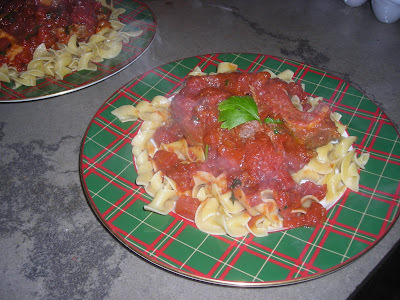 The recipe came from my favorite, Ina Garten, and her latest cookbook, Back to Basics. It is definitely a keeper. 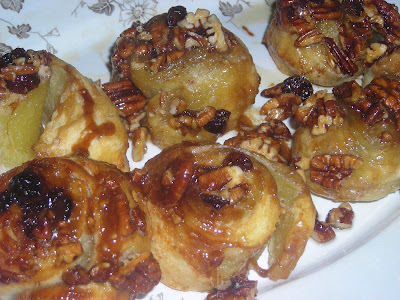 Bake for 30 minutes, until the sticky buns are golden to dark brown on top and firm to the touch. Allow to cool for 5 minutes only, invert the buns onto the parchment paper (ease the filling and pecans out onto the buns with a spoon) and cool completely. NOTE: Be sure to place muffin tins on a cookie sheet as some of the butter came out of mine -- without the cookie sheet I would have had a mess on the oven floor! With wands of lavender in the nightgown drawer and upon the sheet shelf, we have the smell of summer in winter. 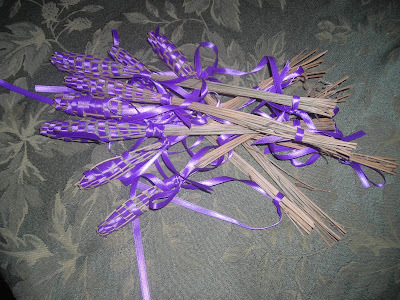 Making lavender wands or bottles is a way to preserve the clean smell of lavender. It's not hard to do and doesn't require great dexterity. 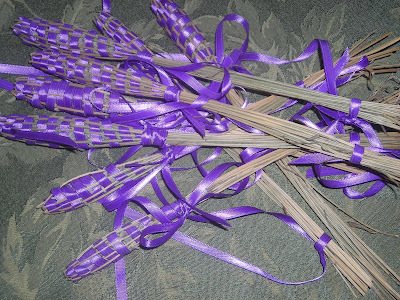 By weaving the ribbons among the lavender stalks, the fragrant buds are enclosed -- thus their fragrance is preserved. They make great gifts, too, either tied along with a box on a Christmas gift for a gardening friend as an "extra" or several in a box as THE gift. Every year in December we bake cookies. Lots of cookies! We always bake some German cookies. Sometimes "S" cookies (daughter Sarah thought they were "S" because her name was "S"arah! ), sometimes peppernusse but always springerle. These anise flavored cookies are so good with December coffee. I have a springerle rolling pin to make the imprint in the dough. One of those few kitchen implements that serves but one purpose once a year. 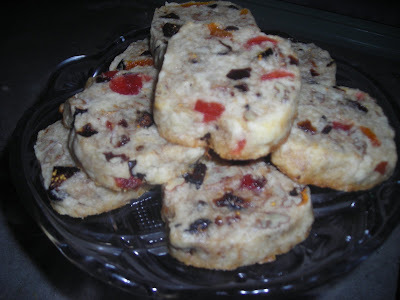 One of our other December loves is fruitcake and although I don't bake fruitcake anymore, fruitcake and eggnog is still a tradition after the Christmas Eve church service. A new cookie this year is these dried fruit cookies from my favorite, Ina Garten. The recipe, first published in her Barefoot at Home cookbook called only for figs, raisins and cherries. Last weekend on her television show, she made them, cut the amount of cherries and added dried apricots. I followed her recipe from the show. 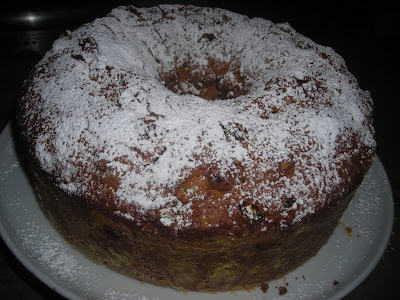 The fruit, marinated for 8 hours in sherry and honey, has a great fruitcake taste. The cookie is almost a shortbread. It takes a while to make because of the marinating fruit so it isn't something you can whip up at a moment's notice. But it does make two large logs of cookies. Rolled in parchment and kept in the fridge. Therefore, you can bake a few fresh cookies off as needed. And another new cookie this year are these orange anise cookies from a Christmas gift cookbook -- A Baker's Odyssey by Greg Patent. From Italy, the book didn't designate them Christmas cookies but with the colored sprinkles on top, if you use green, they do look Christmasy. These are definitely anise flavored and if you're not a fan of licorice you won't be a fan of these cookies. So many European sweets -- no matter what country -- are licorce flavored. But we love licorice which is why there is always a bottle of Virginia Dare anise extract in the pantry. We still have the Christmas tree cutout cookies to make -- Christmas Eve wouldn't be Christmas Eve without them. We'll do that this afternoon. Don't forget, at Linderhof, Christmas is Cookies! Beat the eggs with an electric mixer for 1 minute until frothy. Gradually add sugar and beat until thick -- 2 to 3 minutes. While beating slowly add the olive oil. On low speed, beat in the milk zest, orange juice and extract. With a wooden spoon, stir in the flour mixture in two increments. The dough will be sticky, if it's too sticky, add 2 to 3 T. more flour a tablespoon at a time. Cover the bowl loosely with a kitchen towel and let the dough rest for 20 to 30 minutes. Put the rack in the center of the oven and preheat to 350. Line two baking sheets with silpats or parchment. Roll rounded teaspoonfuls of dough between your palms into smooth balls measure a scant 1 inch in diameter. Set the balls about 2 inches apart on the prepared sheets. Bake one sheet at a time until the botoms of the cookies are lightly browned and their tops have cracks and are barely colored, 10 to 12 minutes. They will almost doublein size during baking. Do not overake -- the cookies should be tender, not dry. Cool the cookies on the cookie sheets for 3 to 5 minutes, then transfer them to a cooling rack to cool completely. In a small bowl, combine the sugar, butter, orange juice 4 t. milk and the extract and beat with an electric mixture until smooth and thick. Beat in 1 to 2 t. more milk until the icing is the consistency of heavy cream. One at a time, dip the tops of 5 or 6 cookies in the icing, then set them on the cooling rack and dust them immediately with colored sprinkles (I chose green for Christmas.) Repeat with the remaining cookies. 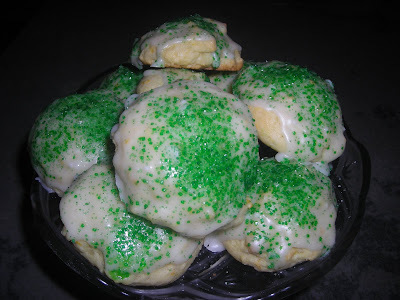 Although you can serve the cookies once the icing has set, they really are best if made a day ahead. We don't have crab or mussels or clams or salmon in the rivers and streams and lakes on the prairie but we do have catfish. Sometimes BIG catfish! 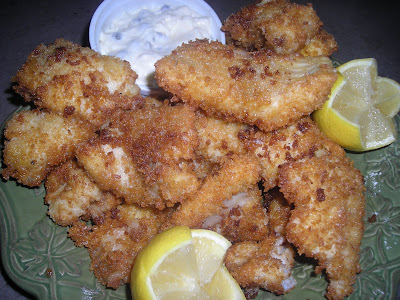 And catfish is Husband Jim's favorite fish for he was raised on catfish. Catfish that they caught in the summer at their cabin on the lake. 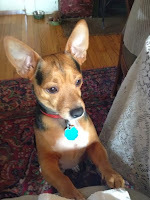 I, on the other hand, was raised on packaged meat from the market. Which is why, I think, that I've never been overly fond of catfish. (although I adore crab and mussels and claims and salmon and shrimp). 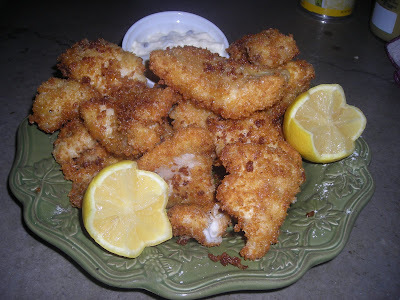 But it is Christmas and sometimes Christmas wishes can be filled before December 25 and so I made a big plate of fried catfish for Husband Jim. He was in fish heaven! Served, of course, with a ramekin of homemade tartar sauce. It needs deep oil for frying and unlike some, I don't use cornmeal preferring instead the flour, egg and Panko method. The Panko get nice and crispy -- crispier I think than either cornmeal or batter. Served as the lone dish for dinner. With a heaping plate of catfish, you need nothing else. 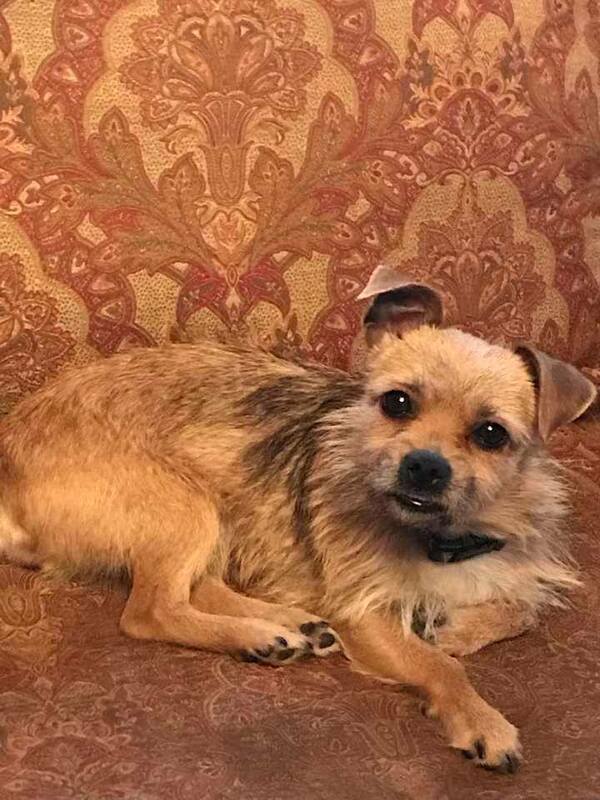 Is on a table in my living room. Complete with shepherds, sheep and even a sheep dog as well as the wisemen and camels. Mary, Joseph and Baby Jesus are in the stable along with the burro and one cow. 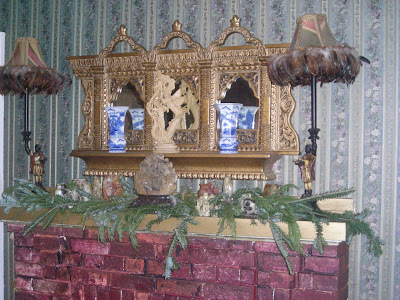 It was my grandmother's and it was an important part of my Christmas memories as a child. Bought at a dimestore in the early 50's, it was missing a wise man and a camel which I found at flea markets. And it came without stable -- somehow that had disappeared. But that was easily replaced. Some of the pieces are chipped or damaged and one sheep really only has three legs (the result of my indulgent grandmother allowing me to play with the set when I was a child). 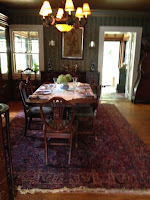 And she always put it on the window seat in her dining room. 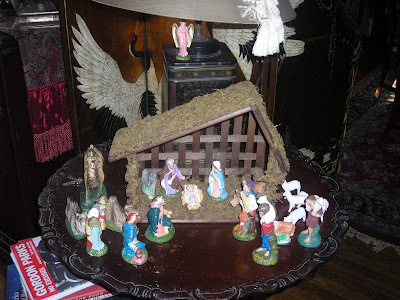 I have a picture of this nativity set in her house in the 50's -- perhaps the picture was taken because she had just gotten it. Both the set and the picture are dear to me. 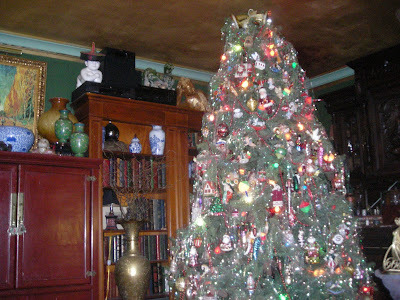 And in the midst of all the food and gifts and trimmings, it is the best reminder of what we will be celebrating in a few days. That's how much the beef cost for dinner last night. Not per serving nor per pound but for all three of the beef shanks in the package. There were two large ones and one small one -- enough for a meal for the two of us. As temperatures plummeted during the day, once again warming comfort food would make the perfect dinner. And there's nothing like a braise simmering in the kitchen on a cold or a snowy day. A favorite recipe for Braised Veal Shanks was used for the beef, for on the prairie we prefer our steers in extra large size and rarely see veal in our markets. Everything to make this dish was in the pantry so we didn't have to go out in the cold for provsions. Served over buttered noodles and with a side of roasted asparagus, it was a warming dinner for a cold night. Served on the Christmas china, of course! Saute shanks in butter until lightly colored. Add white wine and salt and pepper to taste. Let the wine boil for about 5 minutes, add tomatoes, and let them soften in the wine and butter. Add the broth, cover skillet, and simmer shanks 1 1/2 hours until tender. DO NOT OVERCOOK or meat will become stringy and fall away from bones. Transfer shanks to platter and sprinkle with the garlic, lemon and parsley. 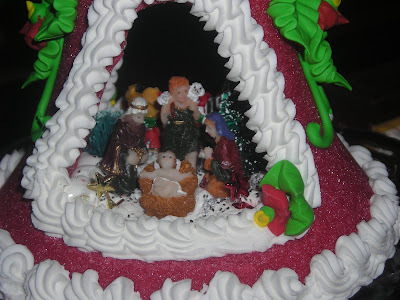 Not to eat but a true treasure of Christmas fantasy. 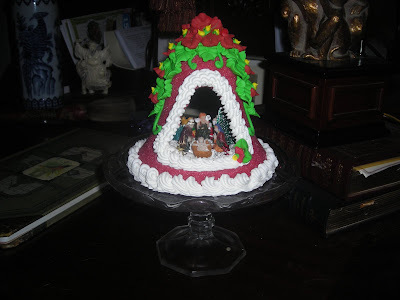 A sugar bell filled inside with a nativity scene as well as, on the other side a Santa Clause theme. Not a creation from the kitchen of Linderhof, but rather a birthday gift from a dear friend. Except for the figures inside it would be entirely edible but, of course, it's not to be eaten, but rather displayed and if you store it correctly, it should last 30 years or more. It's cousin is the sugar Easter eggs with the bunnies and chicks inside and I had one of those as a child. 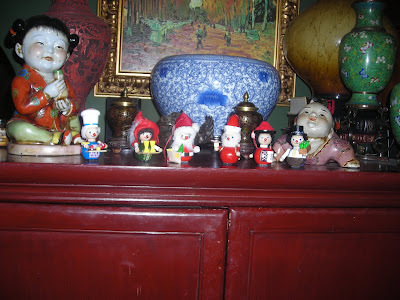 It was fascinating to me, the little figures inside that sugar egg. This whimsical Christmas bell will be part of Linderhof's decorations for many years to come. Fudge has always played a big part in our Christmas celebrations. As there could not be a Christmas if there wasn't cookies, there can't be Christmas without fudge. My parent were friends of the Russell Stovers (of candy fame) and somehow, mother was able to get Clara to share "the" fudge recipe. That was our Christmas fudge for years. In winter, often when we wanted something sweet, mother would whip up a batch of Hershey's cocoa fudge. It was easy, fairly inexpensive -- a little cocoa, some sugar, milk -- it was quick and my brother and I loved it. One time, she goofed and we ended up with tootsie rolls! 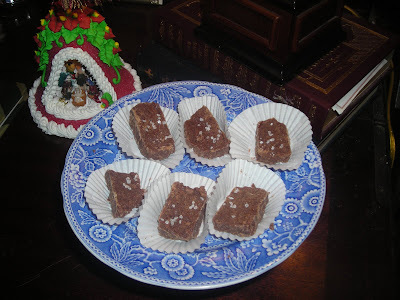 2008 seems to be the year of the "fleur de sel" -- there are caramels (from Ina Garten), toffee (from Martha Stewart) and fudge (from Supper in Stereo). When I found the fleur de sel fudge, I just had to make it. And once made, I was hooked. It's sweet but salty as well. 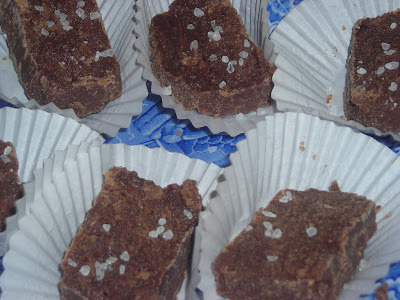 The fleur de sel gives a nice "crunch" to the fudge. It reminded me of when, in my other life, after a particularly stressful afternoon, I would first hit the machine for a chocolate bar and after finishing that would end up getting some potato chips. This fudge has that sweet/salty flavor. We've polished off one batch of fudge (made for a friend whom the sleet prevented us from visiting -- what is one to do but make the sacrifice and eat it) and have almost finished the second. I'm sure another batch will be made before Christmas. 1. 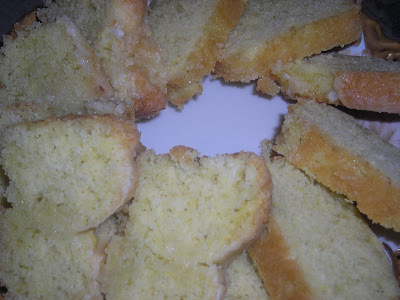 Grease an 8×8 square or 9-inch round cake pan with butter. Set aside. 2.Place milk, cream, sugar, and cocoa powder in a heavy-bottomed pot, and bring to a boil on medium-high heat, stirring occasionally. When the mixture is boiling, turn it down to medium to prevent it from boiling over. Monitor with a candy thermometer, stirring occasionally if necessary. 3. When mixture reaches soft ball stage, or 234-240 F, remove from heat and beat vigorously until the mixture has lost its glossy appearance. Stir in butter and vanilla, then gently stir in 1/2 tsp. fleur de sel. 4. Pour fudge into prepared cake pan, and sprinkle remaining fleur de sel on top. Leave to cool before cutting into small squares. We love coq au vin but when internet friend, Mary, posted this coq au vin blanc on her blog, One Perfect Bite, I knew I had to make it. It's an easy recipe to do and uses Riesling instead of a red wine as coq au vin does. Of course, coming from the Alsace region of France, using Riesling makes perfect sense. I, however, shook things up a bit and used a Riesling from Australia! (Stoneybrook, a good Riesling even though it came with a screw cap!) And we drank the rest with dinner. 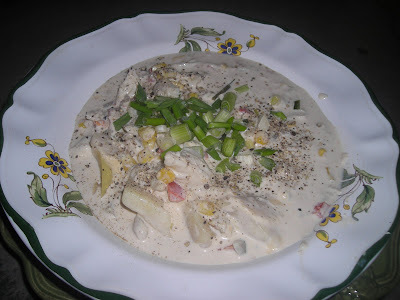 It was a cold and snowy night and comfort food was called for -- this is one of those perfect comfort food dishes. 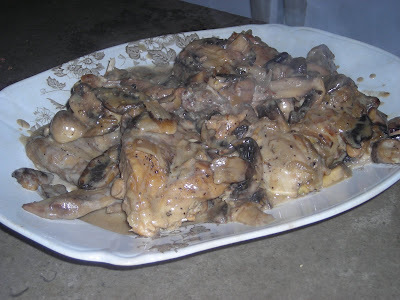 It was simple to prepare and didn't require a long stew as so many coq au vin recipes do. Of course, the original purpose of coq au vin was to cook an old rooster. An old tough rooster. Our supermarket chickens are much younger and much more tender. 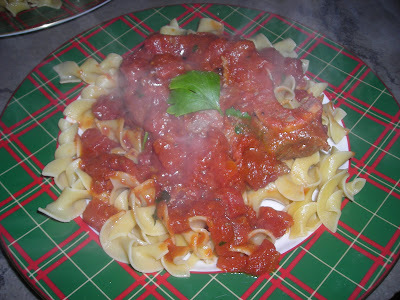 A long simmer is not needed so this recipe is perfect! Served with oven roasted Yukon golds and green beans (a new spin on the summer classic of green beans and new potatoes) it was a perfect meal for a snowy eve. Served, of course, as all meals are in December, on the Christmas china. It's no wonder that we eat very little soup in December! 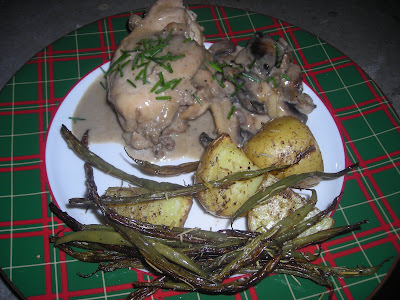 The recipe, from Mary, has been renamed by me -- to Mary's Coq au Vin Blanc. A way to remember an old friend. Melt 2 T. butter in a large skillet. Add chicken, season with salt and pepper and cook over moderate heat until slightly browned, about 4 min per side. Add shallot and cook, stirring for 1 minute. Add Cognac, and carefully ignite it with a long match. 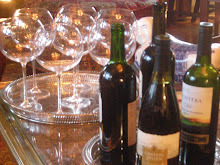 When flames subside, add Riesling, cover and simmer over low heat until chicken breasts are just cooked, about 25 min. Transfer breasts to a large plate and cover with foil. Cover and simmer legs until cooked through, about 10 min. longer. Transfer to plate. Meanwhile in a medium skillet, melt 2 T. of butter. Add mushrooms, season with salt and papper and cook over low heat until liquid evaporates, about 7 min. Increase heat to moderate and cook, stirring, until browned, about 3 min. In a bowl, blend flour and remaining 1 T. butter. Stir cream into the large skillet, bring to a simmer. 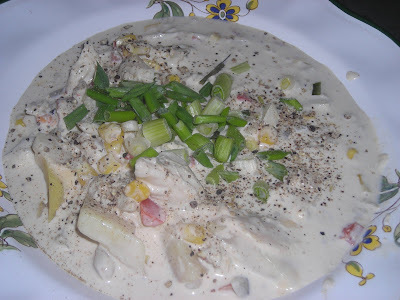 Gradually whisk flour paste into cooking liquid and simmer, whisking until no floury taste remains, about 3 min longer. Season with salt and pepper. 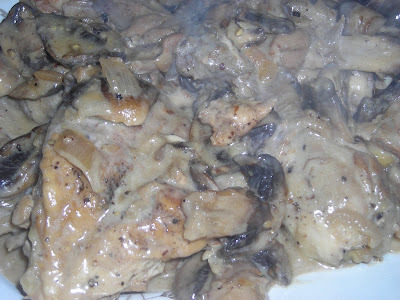 Return the chicken to the skillet, add mushrooms and briefly reheat. 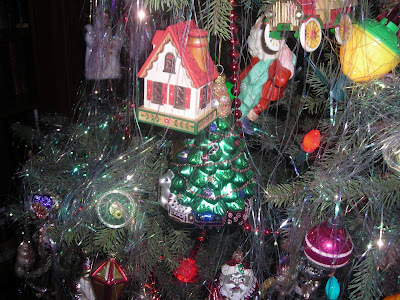 With our tree being on ornament overload, I restrain myself from buying Christmas ornaments with the exception of a dated silver Reed and Barton bell. 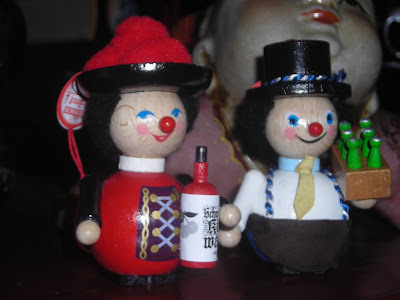 Until I found these Steinbach (the people who make the real German nutcrackers) ornaments at T J Maxx in the south city Saturday. A steal of a deal at $5.50 each, I carefully chose only six (out of about 20 different ones). 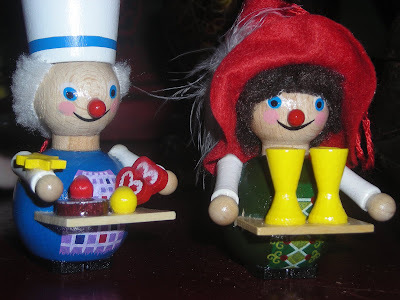 I didn't buy them in Germany but they will remind me of our German trip for they are clever wooden ornaments with a bit of whimsey. Obviously, it was a hard choice to chose six out of 20 and I did go through each box, selecting about 10 and then finally narrowing the choice down to my designated number of six. Since husband Jim once owned a wine and spirits shop -- one holding Kirchwasser and one holding a six pack of beer. 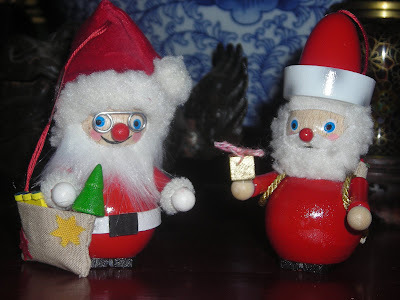 How can you have German ornaments without Santa Claus being represented? A baker for me and more beer for husband Jim! They're on our tree and I must admit that it was hard to find a branch to hang them from. But special ornaments such as these deserve a place on Linderhof's tree. Starting in October, pumpkin finds it way to the table often at Linderhof. Pumpkin cookies, pumpkin bread, pumpkin cake, pumpkin pie, pumpkin soup and perhaps my favorite pumpkin recipe, a pumpkin cranberry coffeecake which I bake for most Saturday breakfasts during November. When company was coming for dessert only, I thought of this pumpkin ginger cake which I had not made before but since I love anything pumpkin and anything ginger, this cake had to be a winner. 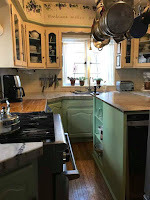 From one of my favorite cookbook authors, Anna Pump, and found in perhaps my favorite cookbook, Country Weekend Entertaining. As with any of Anna's recipes, this did not disappoint. It has been elevated to my favorite pumpkin cake. Butter a 9 by 4 1/2 inch Turks head or bundt pan with 12 cup capacity. In a bowl, beat the eggs, oil and sugar with an electric mixer for about 3 minutes, until creamy. Add the pumpkin puree and mix to blend. Add 3 cups of flour, the baking soda, baking powder, salt, ginger, cinnamon, cloves and nutmeg. Mix at low speed until the batter is smooth and well blended. 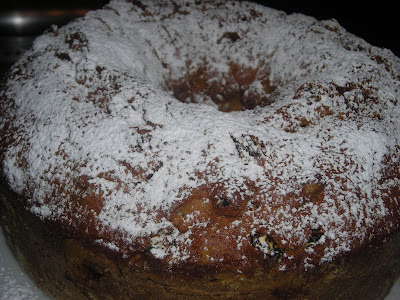 Separately, combine the remaining 1/2 cup of flour with the raisins and walnuts. Fold this into the batter. Spoon the batter into the prepared cake pan. 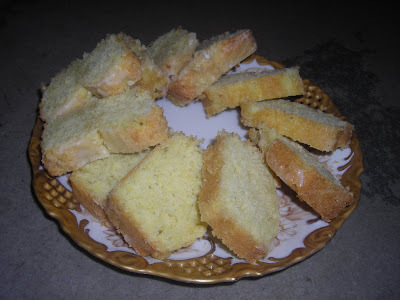 Set the pan into the middle of the oven and bake for 1 hour and 10 to 15 minutes or untl a toothpick inserted into the cake comes out clean. Remove the cake from the oven and let it set for 30 minutes. Using a knife, loosen the top edge of the cake. Invert the cake onto a plate and let it cool completely for 6 hours or overnight. When ready to serve, dust the cake with powdered sugar. I love cloches in the garden -- as much for decoration as for practicality. 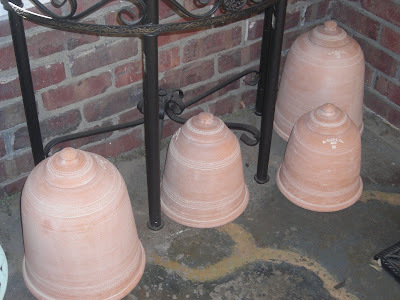 My latest acquisition (a Christmas present to myself) are these four Guy Wolff rhubarb forcing pots or terra cotta cloches. A "been wanting forever" item, I decided to splurge and treat myself to not one or two but four! 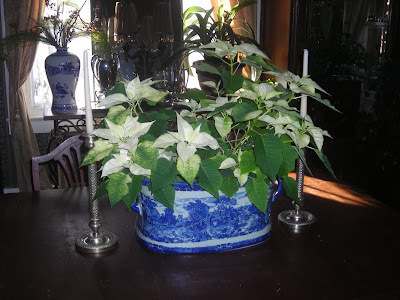 They shall look great in the garden this spring and in the meantime will winter on the front porch. Whether I shall use them for their intended purpose or use them just for decoration remains to be seen but I've been toying with the idea of adding some vegetables and fruits to the herbs and flowers in the garden. Rhubarb, I think, would be a wonderful addition. 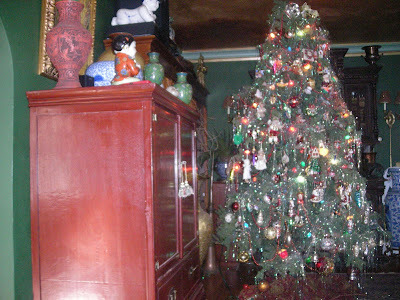 This year, we decided to go back to the simplicity of the Christmases of my childhood. 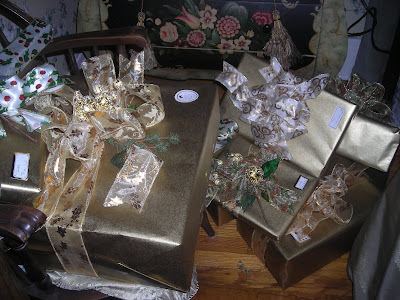 Thus, many of our Christmas "treasures" remained on the shelves in the basement. Simple fresh greens put around our mantle display. A couple of large pine cones added here and there. 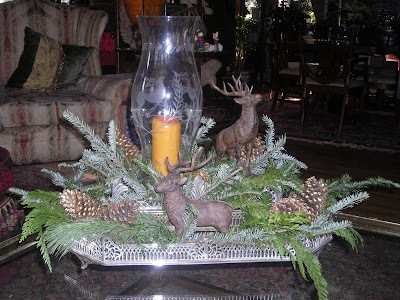 With the hurricane as inspiration and three freshly polished silver trays, I got two iron deer up from the basement shelves and added fresh greens and pine cones for the coffee table. Not so much a Christmas centerpiece as a winter one. 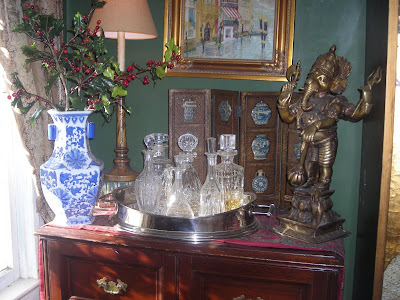 Besides fresh greens, there are holly branches that I put in some of the vases here and there around the house. 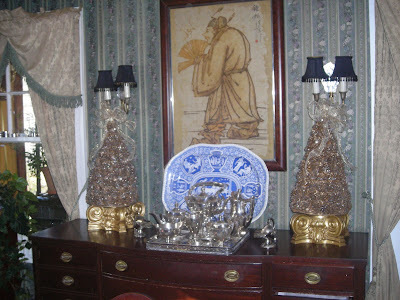 A bit of a touch of Christmas to this corner of the living room. Christmas this year at Linderhof is subtle and I like it -- there is Christmas but it doesn't scream Christmas. There were far fewer trips up and down the basement steps with bins and the Christmas tree is the centerpiece of our decorations this year. 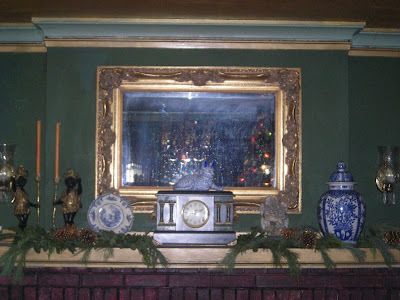 In my childhood, the greens and the poinsettia for the dining room centerpiece were put in place early in December and the house remained so until mid December when the fresh tree was bought, furniture moved and it was placed in the front room window. 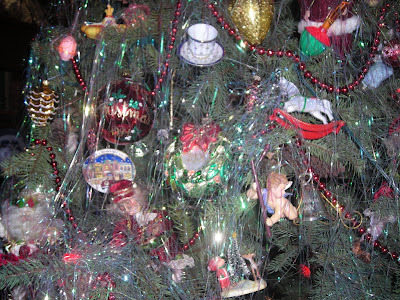 Decorations of big colored bulbs, lots of ornaments (mostly shiny brite ones) and real metal tinsel. We always thought it was the most beautiful tree. 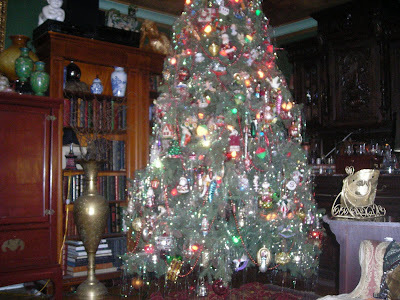 We did ours a bit backward with the tree up early and the greens and poinsettias later. Linderhof is ready for the Christmas season. I love European sweets which really aren't as sweet as they are rich. 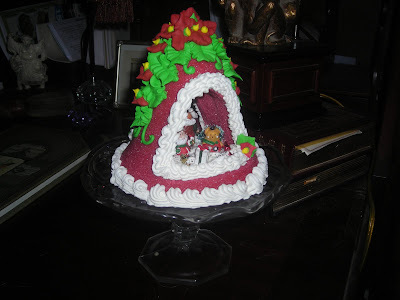 I remember this cake from my childhood -- not from my family but from one of my childhood playmates who always had this cake in her house at Christmas. It's real name is Sand Kage which translated means "sand cake" and what a fun name for a child who spent summers outside making "mud pies" to be actually eating "sand cake"! I was a child and never asked "Grams" for the recipe. We moved away and this cake was no longer part of the flavors of Christmas. I missed this cake at Christmas almost as much as I missed my friend. 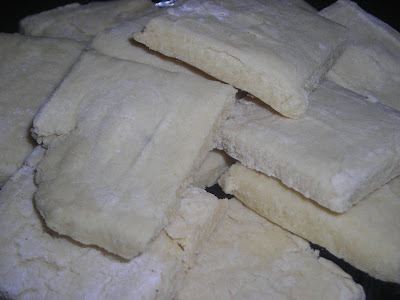 But in perusing a cookbook, Country Weekend Entertaining by Anna Pump, I found a recipe for Sand Kage. 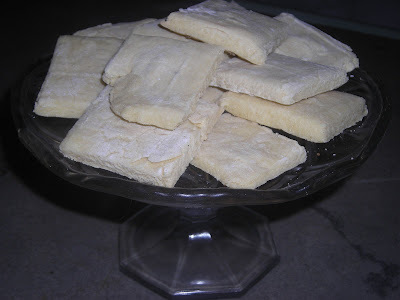 It has the flavor of my childhood sand cake and brings back a flood of memories of my childhood and how wonderful and magical Christmas was back then. Using an electric mixer, in a bowl, cream the butter and sugar together until light. Add the eggs, one at a time, beating well after each addition. Add the rum, lemon rind, cornstarch and baking powder. Beat at low speed until the ingredients are well combined. Spread the batter into a 9 by 5 by 3 inch loaf pan. 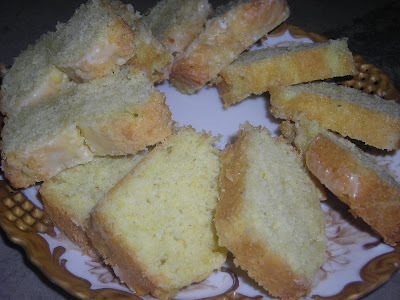 Bake in the center of the oven for 1 hour or until a toothpick inserted in the enter of the cake comes out clean. Cool for 15 minutes. Invert cake onto a plate, then turn it right side up and cool completely. 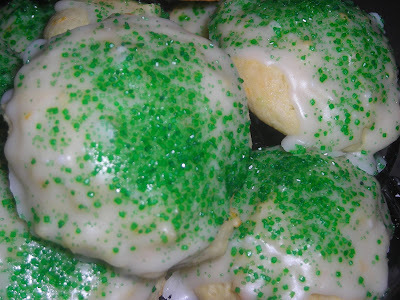 For the glaze, in a bowl, combine the powdered sugar, lemon juice and rum. Beat until smooth. Pour the glaze over the cake. Christmas cards are a tradition at Linderhof. Boxes and boxes of Christmas cards. 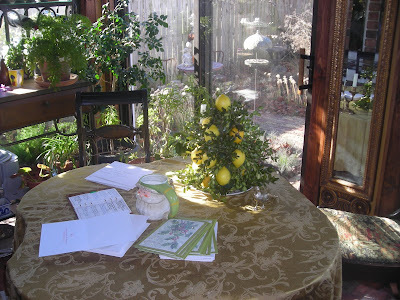 A sunny December afternoon in the breakfast room with a mug of cocoa as I address cards, write short notes in some of them and leave others for long letters which I'll do later. Carols playing softly in the background. Julie Andrews, Kings College Choir, Kings Singers are favorites. I often sing along softly with the carols of Christmas. Some friends are Christmas friends but we've kept in touch for 40 plus years watching children grow up and grandchildren arrive. Changes in employment and finally retirement. 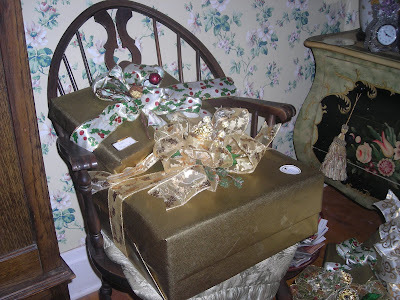 Others are far off friends that we write monthly but we still like to remember them at Christmas. I usually get my cards in after Christmas sales and I like pretty ones with a short message (for there's more space for writing). No funny ones for us. Christmas cards -- a time when you keep in touch with those both near and far.